Cleveland is an ancient area named by the vikings and includes parts of North Yorkshire and South Durham. Marske Woods are said to have small creatures that party and play music. Gisborough Hall has the ghost of a butler, another ghost haunting the lobby area, and a shadowy old woman in the old nursery. 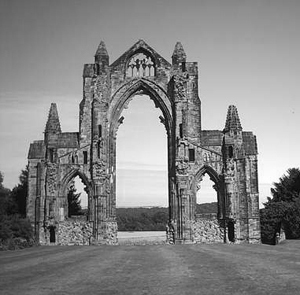 At Gisborough Priory a monk appears once a year to protect buried treasure. Middlesbrough, in the centre of the Cleveland area is said to have a ghost of a drowned child near the old baths area (now captain Cook square) and ghostly figures in the university. There are also many records of orbs in the town centre. For ghost tours in Cleveland contact us. The Grapes Inn Once a nineteenth century staging post on the old coach route across the moors.Many full apparitions of a man have been seen in various parts of the building. Chairs are said to move on their own, footsteps are heard and even very apparent voices that have even left staff not willing to enter certain parts of the building.